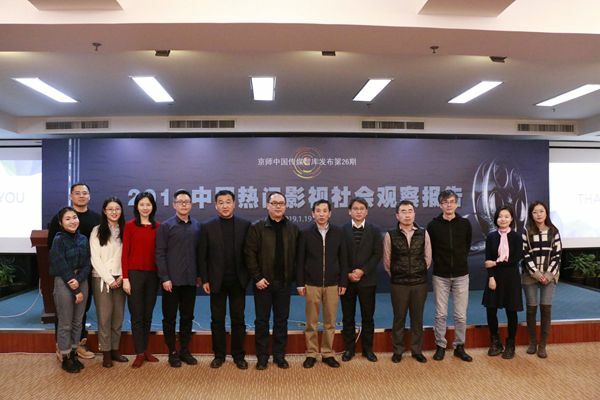 A report on the most successful Chinese films and TV shows of 2018 was released by Beijing Normal University's School of Journalism and Communication in Beijing on Jan. 19. Among the 17 highest-grossing domestic films of 2018, the tearjerker "Dying to Survive," the comedy "Detective Chinatown 2," and "Hello Mr. Billionaire" were the top three most popular films in China. The series "Story of Yanxi Palace," the most Googled TV show on earth in 2018, became the favorite TV drama of Chinese audiences, says the report. According to China's State Film Administration, China's film box office revenue surpassed 60 billion yuan (US $8.7 billion) in 2018, reaching a record high. Domestic films contributed 62.15 percent to the market, earning more than 37.89 billion yuan. This year also saw a diverse array of online dramas that captivated Chinese audiences, generating a great deal of buzz online. The report analyzes Chinese audiences' choice of films and TV shows from a macro perspective, including economic outlook, clean governance, social development, ethics and national defense power. The poll showed that the economic outlook plays the most pivotal role in audiences' decision of likes and dislikes. People who feel optimistic about China's future economy tend to be more interested in films like "Dying to Survive," "Detective Chinatown 2," "Hello Mr. Billionaire" and "Hidden Man," said Wang Yiwen, professor and deputy director of BNU's School of Art and Communication. Furthermore, social issues such as food safety, internet, pollution, and elder care also have a discernible influence on people's film and TV preferences. "Film and TV show are different types of entertainment and arts, reflecting the social life at the same time," said Wang Yichuan, a professor in the School of Arts at Peking University and vice chairman of the China Literature and Art Critics Association. 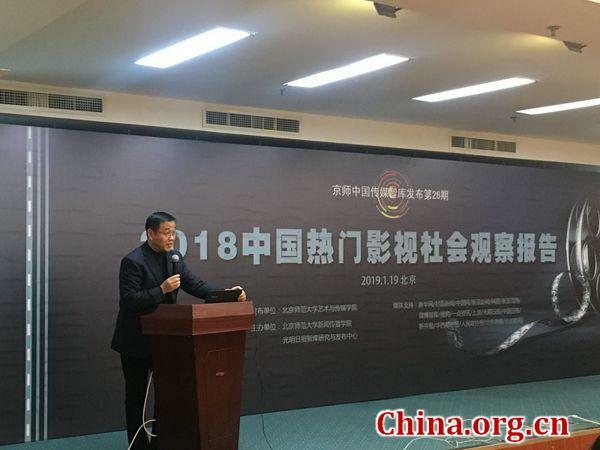 "Therefore, the study would help the film makers to better catch up the trends of the Chinese film market and produce more works of excellent artistic value." Wang Yichuan expressed his appreciation for the enormous achievements of the Chinese film industry and its fast development in recent years, and also expressed his willingness to produce more high-quality films and TV shows that cater to the people's needs as well as national development. The Chinese film industry should do its best to find out what the audience really wants, in a bid to better serve the market and present distinctive Chinese stories to the world, he said. Beijing Normal University's School of Journalism and Communication released a report on the top Chinese films and TV shows of 2018 on Jan. 19.